Fitness Add-On is a second set of images by Barbara Anne Williams that coordinates with the Fitness Designable. Further inspiration for the journey to fabulous fitness includes trainers (tennis shoes, sneakers), a hand weight, a water bottle and a hiking boot for the truly adventurous. Several word art images complete the set along with a nature-walk inspired background paper. 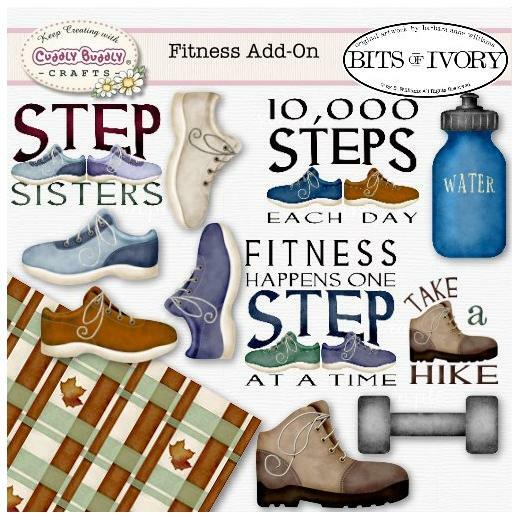 Whether you're documenting fitness goals and accomplishments in a scrapbook or creating a card to encourage or congratulate someone's steps to better health, this motivational set is just the thing.